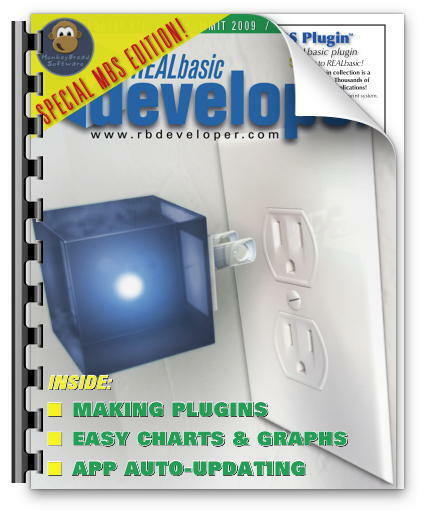 In 2010 we collected a few MBS Plugin related articles into a special edition of the Xojo Developer Magazine (formally REALbasic Developer Magazine). Christian demonstrates his MBS Updater Kit plugin which adds crossplatform self-updating capability to your REALbasic applications. Christian shows how easy it is to create amazing charts and graphs using his ChartDirector plugin for REALbasic. Have you ever wondered how to make a plugin for REALbasic? Christian adapts his talk from the 2009 RB Summit and provides us with an overview of the process. In September Geoffrey attended the RB Summit in Boulder, Colorado, and he provides us with his report.